6.67 points at 3 votes. Galencia can be described as nothing less than a love letter to the 1981 classic Galaga, a proper port of which has never really existed on the C64. The game itself is not a port of the original Zilog Z80 code and it shares no graphical or sound assets with the 1981 game to which it pays considerable homage. The extremely impressive graphics used in Galencia are of a caliber more often associated with the C64 demo scene than C64 games. The game play itself is very familiar to anyone who has ever played a Shoot 'em up. The graphics and sound place Galencia in the same rare territory on the C64 as the likes of Elvira, Newcomer, and Donkey Kong Arcade in that it is a game that, upon casual observation, could be mistaken for a 16-bit Amiga title. Sprites are large and colorful with extremely smooth animations. 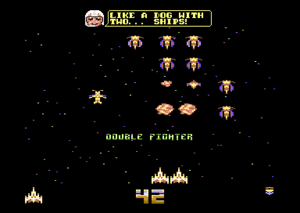 The game far exceeds to well known 8 sprite limit of the VIC-II graphics chip through clever raster timings and careful planning on the part of the developer. Static and animated graphics appear in the border area. The SID music is very up beat and engrossing, very much adding to the ambiance of the game. Galencia was developed over approximately a six month period in 2017. The bulk of the code was written in the first four months while the coder Jason Aldred had the misfortune of being unemployed. Progress slowed somewhat when the developer found full time employment. MOS 6510 Assembly code was written in CBM prg Studio. Graphical assets were created using SpritePad and ChrPad. SID music was created using GoatTracker. Galencia 1.1 · 2017-07-23 · bug fix. Galencia 1.2 · 2017-07-30 · bug fix. Galencia 1.3 · 2017-08-13 · preliminary NTSC support. Galencia 1.4 · 2017-08-20 · full NTSC support. PAL and NTSC support as of v1.4. @JasonNapalm: "Smooth, slick and totally addictive. A surefire SIZZLER in my book." This page was last modified on 8 April 2019, at 01:48.